The quirky looking BMW I3 is getting an upgrade in the new I3s version. What has changed in the new model and does it work? Bumper2Bumpertv tries to find answers to those questions. LENGTH X WIDTH X HEIGHT: 195.1 x 82.3 x 58.9 in. BOTTOM LINE: Combine the practicality of a station wagon with the luxury and handling of a Jaguar XF, and you have the XF SportBrake, a vehicle with very few flaws. I have driven station wagons in my day. Heck, I even owned a Ford LTD Country Squire back in the day. But the Jaguar XF SportBrake is a new take on the old theme. Yes, despite its name, it is a STATION WAGON. Get over it. Unlike the Country Squire, the SportBrake has excellent ride quality. It’s hard to believe you’re driving one of these. Handling is excellent, but then, it is a Jaguar. We had the opportunity to drive the SportBrake over some unfamiliar winding roads at a high rate of speed, and never felt out of control. We also got to play with it on our usual assortment of roads and had a ball. On back roads and highways the ride is firm, but comfortable. We had issues with the cruise control and limit control on the highway, but once we sorted these out, we were fine. You see, the XF has a speed control that looks like cruise control. What it does is keep you at or below your set speed. My problem was that the switches look like cruise control switches, but they aren’t. On the other side, the cruise control has no on/off switch, you just set it. My grandkids loved riding in the back seat, even with limited leg room. They’re addicts to side window shades, so the XF was in their wheelhouse. With the second row seats up, cargo capacity is very good. On our trip up we took clothes for the weekend plus food. We returned with three large chrysanthemum plants and still had plenty of cargo capacity. In this modern world of SUVs, styling of the XF SportBrake is sleek and low. It still evoked aahs and “ooh it’s a Jaguar” comments. The supercharged 3.0-liter V6 delivers good power. There was never any need for more, even though we traveled a few Interstate miles. It also drove well at normal speeds. IN front of the driver is an interesting speedometer. It has enough tick marks to reach well over 100 mph, but only displays the nearest 10 mph around the pointer. In general, the controls are clear, but there is a learning curve, as with the cruise and limit controls. Thankfully, there is a good HVAC system. We drove the XF during some hot Indian summer weather, but the HVAC cooled the cabin quickly and efficiently. Front seats are comfortable with good side support, but don’t forget, this is a Jaguar. Rear legroom is adequate but limited. Rear seats are comfortable and heated, plus they have their own HVAC controls. My granddaughters liked the huge sunroof that extended all the way to the backs of the rear seats. Rear seat back releases are located in the cargo area. All in all, the Jaguar XF SportBrake has all the qualities of the XF sedan plus the added advantage of station wagon utility. And, unlike SUVs, that utility comes without compromising style. The Subaru brand is again stepping up to the plate with a three row SUV. Bumper2Bumpertv has a look at the Ascent which includes a lot of firsts for the brand. Will a three row version make a difference for the Volkswagen Tiguan? The Signature edition of the Mazda6 is an attempt to take the mid size sedan into the fringe of near luxury vehicles. Does it work? Bumper2Bumpertv has an assessment. 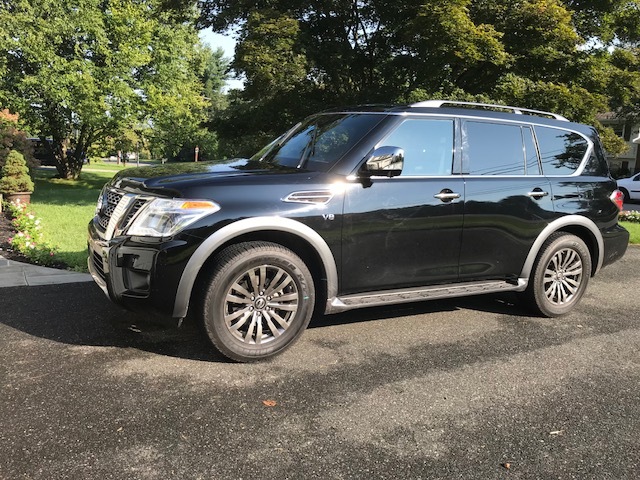 For example, the Expedition (compared with the Navigator) has a more traditional instrument panel, with a speedometer and tachometer and four accessory gauges running along the top of the instrument cluster. The transmission shifter is a rotary dial, as opposed to push buttons in the Nav. And while the Expedition is well appointed, it doesn’t match the luxury of the Navigator. The Ford Expedition is nice package, if pricey. More trucks, fewer cars, Ford hopes it made the right decision. Ford is literally shifting gears from cars to trucks and SUV’s in the North American market. Bumper2Bumpertv takes a look at the Expedition, one of those vehicles the company is pinning its hopes on. LENGTH X WIDTH X HEIGHT: 161.3 x 69.5 x 65.1 in. BOTTOM LINE: Ford’s newest vehicle is the EcoSport, based on the Fiesta, that is a small SUV with surprisingly decent performance. There’s a growing interest in smaller, more fuel-efficient vehicles, yet vehicles that are useful as well. We’ve all seen those little two-passenger sedans on the road, but they have little or no utility. Many utility vehicles, on the other hand, are less than economical. Ford’s answer to this conundrum is the new EcoSport, which is based on the small Fiesta sedan. EcoSport is a small sport utility vehicle, probably more of a crossover utility vehicle, or CUV. Our tester delivered 26.8 mpg in our test, admittedly in primarily local driving. Officially classified as a small SUV, EcoSport is also a fun vehicle to drive. Take it along winding country roads and it reveals its true character. Handling is very good, and it almost feels like a small sports car. You can even shift the transmission into manual mode and use the paddles on the wheel, but I didn’t find that necessary. It was fun enough with the 10-speed automatic. On my way to the golf course, I first lowered the rear seat backs and placed my clubs in. Then the ride began, and I zipped over that back roads. I’ll admit I drove more sanely when my wife was in the EcoSport, but if she needed it, there was a grab handle on the dash if she got nervous. On the center stack is a larger infotainment screen that dominates the dash. During the day it has a clear, white background that turns black at night. The default screen is a map on the left and entertainment options on the right, with a menu along the bottom. The center stack has all the HVAC controls with a pair of USB outlets if you want to plug in. Front seats are comfortable even though side support is minimal. In keeping with the “small” theme, there’s a small cubby that’s ideal for keys on the console. The center console/arm rest is also small. Rear seats offer tight legroom, which was my one major complaint with the EcoSport. Indents in the backs of the front seats help with the knee room, but not much. However, there’s good rear seat headroom. And the rear head restraints fold forward to give the driver better rearward vision. There are clothes hangers above the rear doors, but not assist handles. Unique among the EcoSport’s features is a rear door that opens like a side-hinged door, rather than like a hatch. With the door open, the rear bumper offers a nice seat, which is convenient when you’re changing into golf shoes. Once you figure how to unlatch the door, it’s convenient. As a new entry into Ford’s stable of utility vehicles, the EcoSport could have been just an “eco” car/CUV, but it isn’t. 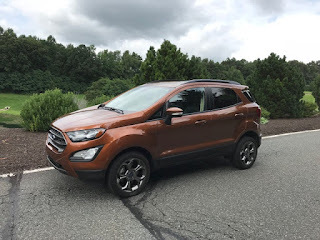 The EcoSport ends up as a nice riding, nice driving vehicle, with the added practicality of utility vehicle styling for those times when you have to tote, but not that much. It’s more like a small - dare I say it? - station wagon that’s ideal for young families or empty nesters.